“After these two gentlemen visited the governor we also went, Grouard and I, to pay our respects to His Excellency.We found him standing alone in the meadow not far from the huge Iroquois canoe that had brought him. He walked around looking bored and annoyed." "Though no kingdom belonged to this man he nevertheless, at this time, had authority in the North-West in all matters of life and death. And, which to him seemed the culmination of disdain and impertinence, a few steps from him, the French Metis gathered in little groups continued to eat their meal of pemmican, playing hand games or napping and exchanging among themselves sly smiles and a few short sentences in the Cree language. The governor Mr. Dallas was one of those happy mortals who believe that their title and fortune give them simply by their appearance a more noble character. Dressed in grey like a simple man- I was going to say beggar-as dry and as straight as if impaled with a stick, he looked hurt that no one among the Metis, of a lower class, recognized his superiority or came to give him homage. His Excellency’s situation touched us and we put ourselves at his disposal. He was polite but lacked some social skills. In his words was a secret melancholy that I didn’t understand until later that evening. His Excellency returned our visit and came to our tent. He, although angry, made sure to speak to us as equals: “Which of the two is the superior?” he began. -We are both equal M. Grouard said hastily. There is no question of superiority or inferiority between us. However as M. Petitot is a year older the bishop has conferred to him the responsibility of our affairs during the voyage. This was a little too much said. Very well said the governor graciously turning his back on my friendly companion in a most noble way. And now master Petitot I am obliged to give you a sad message to give to your bishop.. Yes, very sad, indeed! -What catastrophe, sir? I said quickly. Has something happen on your trip, Excellency? -Oh! no, no, sir, there is no catastrophe but the half-breeds of the Lesperance brigade…. -You mean our brigade! I said. - These half-breeds, he said in the same sad tone of voice, have greatly insulted me when I arrived and also this morning. -I didn’t know you were here since yesterday. -I know, I know. I am speaking of the half-breeds. They were so rude, he said in an agitated manner, even a Company clerk would have been offended. I am asking that you write your bishop so that when they return to the Red River they can be reprimanded. -I assured M. Dallas that I would write the bishop of the matter of the French Metis. But…Dame! I don’t know what a bishop could do when the governor himself is unable. However I reassured him and M. Dallas left satisfied with his little vengeance. I found him a little foolish. He, a man of importance, should have ignored the slight and not complain about it to strangers. Almost right away, the chief factor Christie, a big and friendly Metis Scot entered breathless into our tent. He said in very good French. -Fathers, what did the governor say? -He complained that the Lesperance Metis insulted him and told me to inform the bishop by way of the returning brigade. -Oh! Oh! well. And what does he want Bishop Tache to do or say to the Metis? -Oh! Dame! I don’t know. -You know, I think, it’s all ridiculous. I hope Fathers, for the honour of the Company, you say nothing. It would make us look foolish among the servants. -Also for the honour of His Excellency since I forgot that the Metis would be the ones laughing. -Good. I’d like to add the governor’s complaint is just another way of insulting the priests and bishops and to tell them “Look at the fruits of your labour?” Your flock has no respect for authority. Well I’d like to say your poor Metis are perfectly innocent of the governor’s accusations. -I don’t doubt it for an instant but we don’t know enough to judge. -Perhaps you accuse me of defending the Metis because I am myself a Metis. By George! We are almost all Metis in the Company. Among the chief factors there is not a single Englishman, and maybe not ten Scots with pure blood. It doesn’t stop us from being gentlemen with good manners. Is that not that true? - Exactly. And isn’t Madame Dallas a quarter Metis? His Excellency’s son is therefore a Metis'. -He started to laugh. Exactly. Here is a fact: Governor Dallas comes from London. He is a cold man with strange manners. His head is filled with rules of etiquette, convictions and ideas like an English lord. He wants to establish in the North-West a rule where there are just bishops, priests, ministers and bourgeois who have the right to shake his hand. In their turn, these can only shake hands with the chief traders, the clerks and postmasters but not to the servants or Indians. The assistants to the chief traders can shake hands with the interpreters, guides and perhaps to servants from Europe and the Metis but not with the Indians. Do you consider this formality absurd, here in the North-West? Oh! no, no sir, he continued with animation like he was addressing the governor himself, you will never see that. We are not so extravagant. We are less complicated. -And so, yesterday evening, when M. Dallas arrived, the good Metis came over to welcome him and surrounded him to shake his hand. He moved them away with a great swing of his cane muttering: Rascals!Then he turned his back on them. -That’s what happened. He would have liked the crowd to gaze in admiration at his perfections, to incline their heads like he was a maharajah while yelling Hip! Hip! Hip! Hurrah for the governor! But giving a handshake like equals No! He accused them of being rude, gross half- breeds. -That is what he said. The Metis respect the governor but they don’t feel obliged to offer it to his canoe, his tent or his cooking pot, do you understand? We are not ogres. Well! M. Dallas wants everything that he uses be sacred in the eyes of the public and no one should come nearer that ten feet. -I am more and more astounded. A sultan! A great Mogul! -Yesterday, the Metis put their cooking pots on his Excellency’s fire: they made a circle around his tent while smoking their pipe: they had the nerve to talk to me, the cook of his Excellency. There is the crime! -Cook? Are you serious Mister Christie? -Not at all. Here I am, chief-factor Christie, head of the Saskatchewan District, the humble cook of the governor of the Company, and I eat after him out of his plate. - I almost burst out laughing. But he has lost his head, your governor. -I don’t know if he ever had one. There you go, the whole story, the complaints that he has against your Metis. Oh! I almost forgot the last one. This morning was the last straw: Coming out of his tent, His Excellency found two or three wagons that they had forgotten during the night a few feet from his tent. He came in so angry he was unable to eat his breakfast. If he keeps this up I’ll quit as his cook and perhaps lose my position as chief factor with its wonderful appointments." Note: Alexander Grant Dallas resigned as governor of Rupert's Land in 1864. 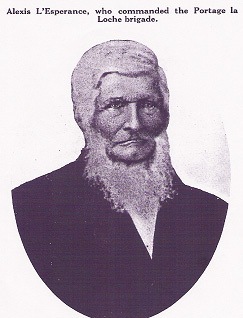 Alexi Bonami L'Esperance commanded the Portage La Loche brigade. 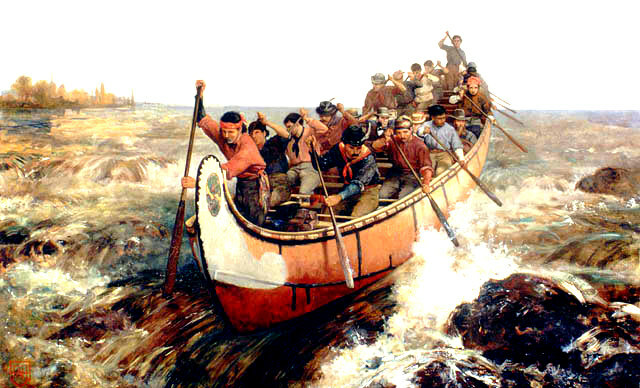 The brigade consisted of seven York boats and 65 crewmen, mostly French Cree Metis, from the Red River Settlement. ......read more "The Portage La Loche Brigade" on this site. .............from "The History of La Loche"